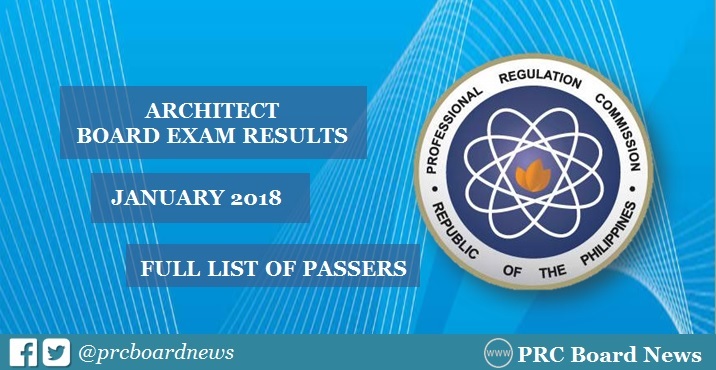 MANILA, Philippines – (Updated February 1) The Professional Regulation Commission (PRC) and the Board of Architecture (BoA) released results of January 2018 Architect board exam or Architect Licensure Examination (ALE) on Thursday, February 1, 2018 or in four (4) working days after the last day of examinations. The official list of passers, top 10 (topnotchers), top performing schools and performance of schools are available on this page as announced online. UPDATE: PRC said that 1,126 out of 1,955 passed the exams. PRC administered the first Architect board exam this year in Manila, Baguio, Cebu, Davao and Legaspi on January 26 (Friday) and 28 (Sunday). The Board of Architecture who gave the licensure exam is headed by its Chairman, Arch. Robert S. Sac with two other members, Arch. Fidel Jose R. Siapno and Arch. Robert M. Mirafuente. PRC said that registration for the issuance of Professional Identification Card (ID) and Certificate of Registration will be done on-line. Visit www.prc.gov.ph and follow instructions for initial registration. The date and venue for the mass oathtaking of the successful examinees in the said licensure examination WILL BE ANNOUNCED LATER, PRC said. The two-day exam covered the following subjects: history and theory of architecture, principle of planning and architecture practice, utilities systems, structural conceptualization, building materials and construction (January 26) and architectural design and site planning (January 28). According to PRC Resolution No. 2017-1068, the target release of Architect board exam result is on Wednesday, January 31, or in three (3) working days after the exams. However, results are possible to be released ahead of the target or on later date, without prior notice. We advise takers to monitor announcement of result until Friday, February 2. In the January 2017 exam, results were released online after five (5) working days. A total of 919 out of 1,595 passed the Architect board exam. In the January 2016 exams, results were announced in 5 working days. A total of 866 out of 1,556 passed the tests. Good luck to all takers! ALE results out soon. Kaway-kaway sa mga bagong architects! Wonderful post,Individual and social preparing is the sort in which people come to consider themselves but you can get useful reference for best work. about their lifestyle or measures, this sort of bearing augmentation the conviction and affirmation among the comprehensive network. For the admission of the university there must have needed a better appeal letter which would let you select easily and for this you need to go to you could check here and get your appeal letter. If there has a chance to find out the mistakes instantly then see more details within very little time and the whole things have been done so perfectly with no time gap there. Direction has served in each field of life in light of setting we up can sit in ventilation structure rooms in more details and we can make our room warm in winter these things have wound up being just conceivable with planning. Everyone is strikingly amped up for electronic arranging in light of how online course is phenomenally fascinating and magnificent also. I am in like path to a phenomenal degree amped up for electronic preparing great samples and I routinely use to watch video addresses and get distinctive fundamental information about the thorough system of remote countries.